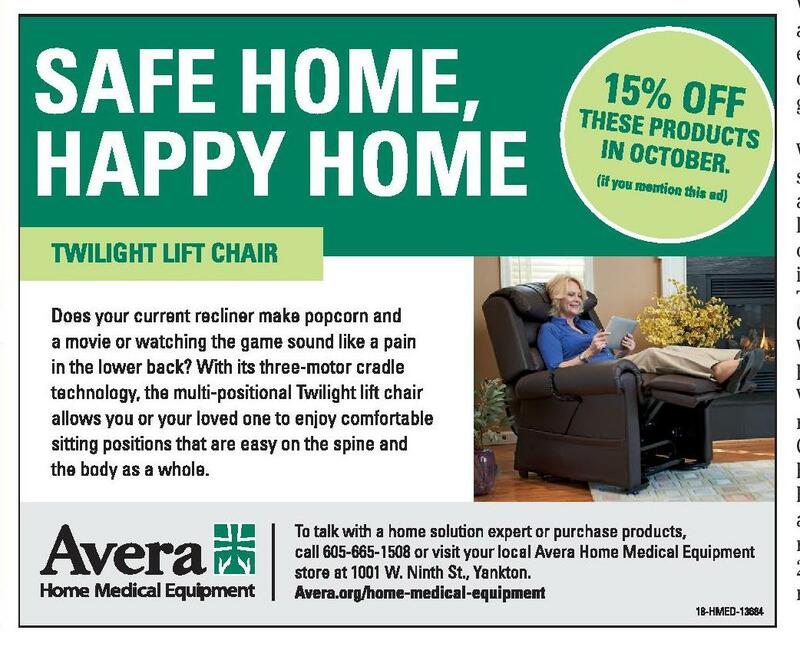 October 23, 2018 • Page 8 shop online at www.missourivalleyshopper.com Check out the for great specials at your local restaurants! In Print and Online! AUCTIONS AUCTION Saturday, Oct. 27 -- 11 a.m. 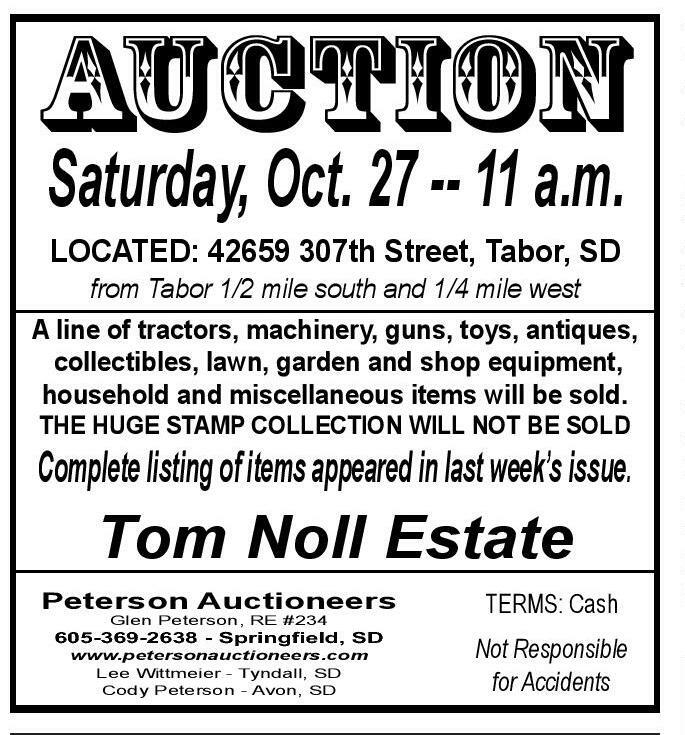 LOCATED: 42659 307th Street, Tabor, SD from Tabor 1/2 mile south and 1/4 mile west A line of tractors, machinery, guns, toys, antiques, collectibles, lawn, garden and shop equipment, household and miscellaneous items will be sold. THE HUGE STAMP COLLECTION WILL NOT BE SOLD Complete listing of items appeared in last week’s issue. Tom Noll Estate Peterson Auctioneers TERMS: Cash www.petersonauctioneers.com Lee Wittmeier - Tyndall, SD Cody Peterson - Avon, SD PUC Approves Refund And Lower Rate For Montana-Dakota Utilities Co. Customers PIERRE, S.D. – This week the South Dakota Public Utilities Commission approved a refund and reduction of rates for Montana-Dakota Utilities Co. customers as a result of the federal tax cuts enacted late last year. The total refund to be distributed among Montana-Dakota’s natural gas customers is $1,326,915; the company will refund $591,424 to electric customers. Refunds will appear as a credit on customer accounts in mid-February. An average residential natural gas customer will receive an estimated $14.05 refund; an average residential electric customer will receive an estimated $41.84 refund. The commission additionally approved a reduction of Montana-Dakota’s base rates. The amount of the rate reduction was determined by PUC staff and Montana-Dakota representatives completing a review of 2017 test year data considered in calculation of the 2018 refund amount and further adjusted to include plant additions placed into service by Oct. 31, 2018. The company currently estimates the base rate reduction will be approximately $250,000 for Montana-Dakota’s South Dakota electric customers and $300,000 for the company’s South Dakota natural gas customers. The final rate reduction will be determined by Dec. 1, 2018, and submitted to the commission for review. PUC Chairperson Kristie Fiegen stated that consumer protection was her primary focus in reviewing the docket. “Looking out for the customer is my number one concern. This outcome is fair to the company and passes the benefits of the tax cut to consumers,” Fiegen said. PUC Vice Chairman Gary Hanson observed, “This is a gift that keeps on giving. 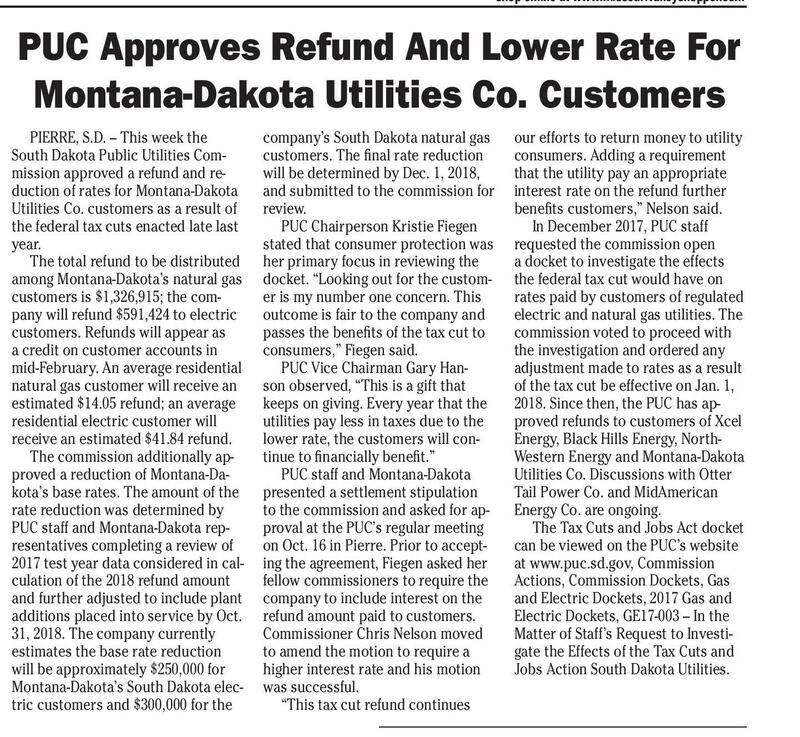 Every year that the utilities pay less in taxes due to the lower rate, the customers will continue to financially benefit.” PUC staff and Montana-Dakota presented a settlement stipulation to the commission and asked for approval at the PUC’s regular meeting on Oct. 16 in Pierre. Prior to accepting the agreement, Fiegen asked her fellow commissioners to require the company to include interest on the refund amount paid to customers. Commissioner Chris Nelson moved to amend the motion to require a higher interest rate and his motion was successful. “This tax cut refund continues Not Responsible for Accidents Glen Peterson, RE #234 SD Chamber Seminar Looks At The Economy And Value Added Agriculture Knox County Land for SaLe 37.04 acres, more or less Located approximately 8½ miles West of Crofton, Nebraska Legal: A surveyed tract of land situated in the South Half of the Southwest Quarter (S1/2 SW1/4) of Section Twenty-one (21), Township Thirty-two (32) North, Range 3 West of the 6th P .M., Knox County, NE, consisting of 37.04 acres, more or less. 319 Walnut St. Yankton, SD 57078 605-665-5884 Property includes acreage with a 2 story, 3 bedroom home with 2-car attached garage, and several outbuildings Please call Archbold Law Office, LLP at (402) 373-4240 to receive a bid package. Earn as much as $400+ this month & $120 this week Interested parties should submit a bid in writing, no later than 4:00 P .M., on October 29, 2018. 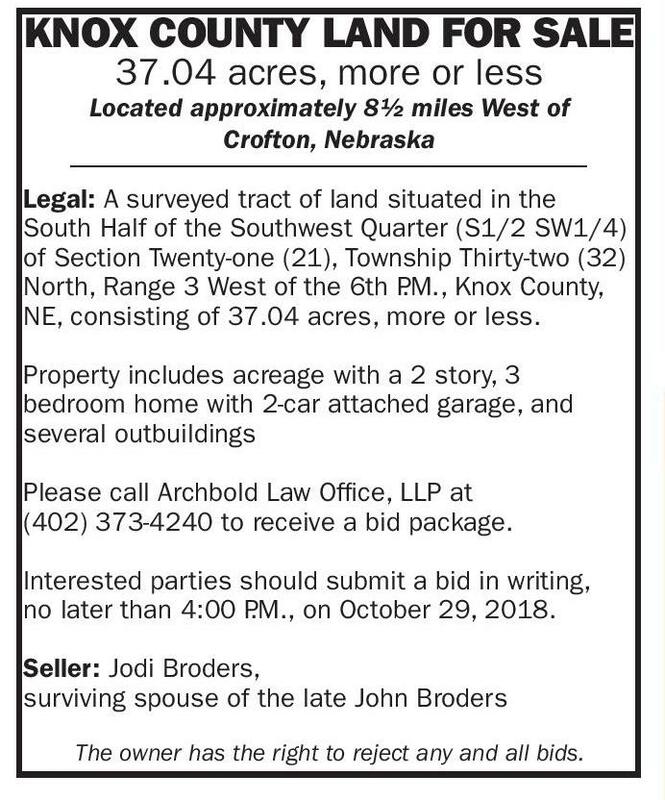 Seller: Jodi Broders, surviving spouse of the late John Broders The owner has the right to reject any and all bids. 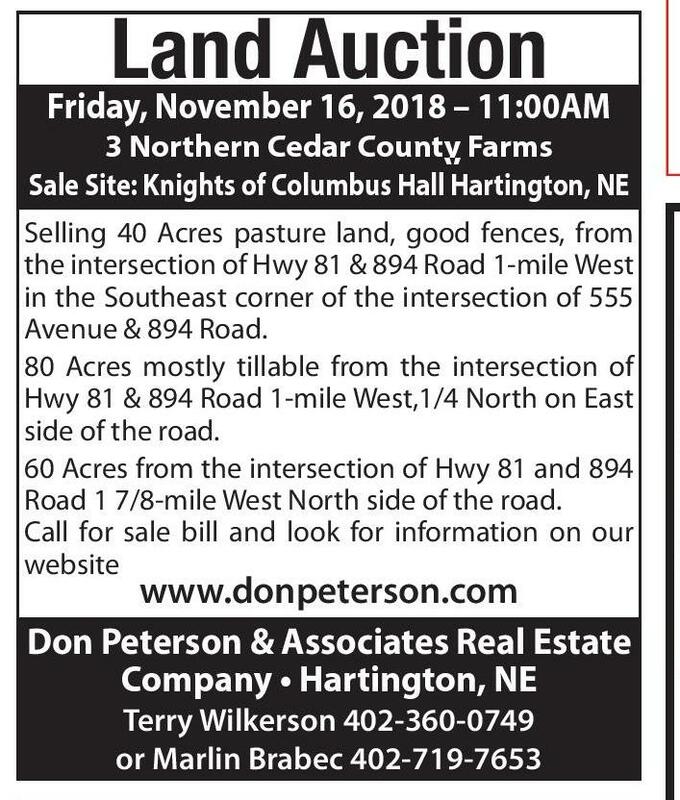 Land Auction Friday, November 16, 2018 – 11:00AM 3 Northern Cedar County Farms Sale Site: Knights of Columbus Hall Hartington, NE Selling 40 Acres pasture land, good fences, from the intersection of Hwy 81 & 894 Road 1-mile West in the Southeast corner of the intersection of 555 Avenue & 894 Road. 80 Acres mostly tillable from the intersection of Hwy 81 & 894 Road 1-mile West,1/4 North on East side of the road. 60 Acres from the intersection of Hwy 81 and 894 Road 1 7/8-mile West North side of the road. 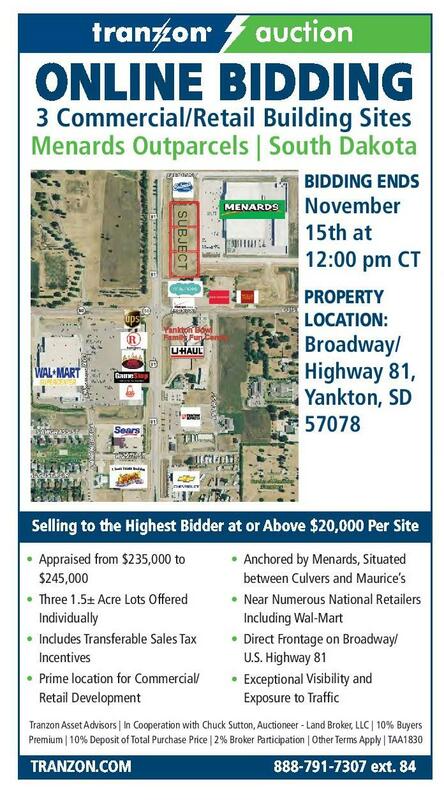 Call for sale bill and look for information on our website www.donpeterson.com Don Peterson & Associates Real Estate Company • Hartington, NE Terry Wilkerson 402-360-0749 or Marlin Brabec 402-719-7653 ONLINE BIDDING 3 Commercial/Retail Building Sites Menards Outparcels | South Dakota BIDDING ENDS November 15th at 12:00 pm CT PROPERTY LOCATION: Broadway/ Highway 81, Yankton, SD 57078 Selling to the Highest Bidder at or Above $20,000 Per Site • Appraised from $235,000 to $245,000 • Anchored by Menards, Situated between Culvers and Maurice’s • Three 1.5± Acre Lots Offered Individually • Near Numerous National Retailers Including Wal-Mart • Includes Transferable Sales Tax Incentives • Direct Frontage on Broadway/ U.S. Highway 81 • Prime location for Commercial/ Retail Development • Exceptional Visibility and Exposure to Traffic Tranzon Asset Advisors | In Cooperation with Chuck Sutton, Auctioneer - Land Broker, LLC | 10% Buyers Premium | 10% Deposit of Total Purchase Price | 2% Broker Participation | Other Terms Apply | TAA1830 TRANZON.COM 888-791-7307 ext. 84 our efforts to return money to utility consumers. Adding a requirement that the utility pay an appropriate interest rate on the refund further benefits customers,” Nelson said. In December 2017, PUC staff requested the commission open a docket to investigate the effects the federal tax cut would have on rates paid by customers of regulated electric and natural gas utilities. The commission voted to proceed with the investigation and ordered any adjustment made to rates as a result of the tax cut be effective on Jan. 1, 2018. Since then, the PUC has approved refunds to customers of Xcel Energy, Black Hills Energy, NorthWestern Energy and Montana-Dakota Utilities Co. Discussions with Otter Tail Power Co. and MidAmerican Energy Co. are ongoing. The Tax Cuts and Jobs Act docket can be viewed on the PUC’s website at www.puc.sd.gov, Commission Actions, Commission Dockets, Gas and Electric Dockets, 2017 Gas and Electric Dockets, GE17-003 – In the Matter of Staff’s Request to Investigate the Effects of the Tax Cuts and Jobs Action South Dakota Utilities. 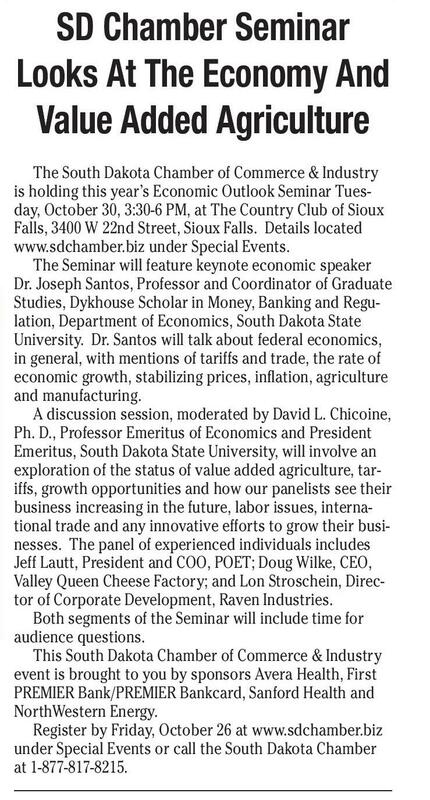 Congratulations The South Dakota Chamber of Commerce & Industry is holding this year’s Economic Outlook Seminar Tuesday, October 30, 3:30-6 PM, at The Country Club of Sioux Falls, 3400 W 22nd Street, Sioux Falls. Details located www.sdchamber.biz under Special Events. The Seminar will feature keynote economic speaker Dr. Joseph Santos, Professor and Coordinator of Graduate Studies, Dykhouse Scholar in Money, Banking and Regulation, Department of Economics, South Dakota State University. Dr. Santos will talk about federal economics, in general, with mentions of tariffs and trade, the rate of economic growth, stabilizing prices, inflation, agriculture and manufacturing. A discussion session, moderated by David L. Chicoine, Ph. D., Professor Emeritus of Economics and President Emeritus, South Dakota State University, will involve an exploration of the status of value added agriculture, tariffs, growth opportunities and how our panelists see their business increasing in the future, labor issues, international trade and any innovative efforts to grow their businesses. The panel of experienced individuals includes Jeff Lautt, President and COO, POET; Doug Wilke, CEO, Valley Queen Cheese Factory; and Lon Stroschein, Director of Corporate Development, Raven Industries. Both segments of the Seminar will include time for audience questions. This South Dakota Chamber of Commerce & Industry event is brought to you by sponsors Avera Health, First PREMIER Bank/PREMIER Bankcard, Sanford Health and NorthWestern Energy. Register by Friday, October 26 at www.sdchamber.biz under Special Events or call the South Dakota Chamber at 1-877-817-8215. 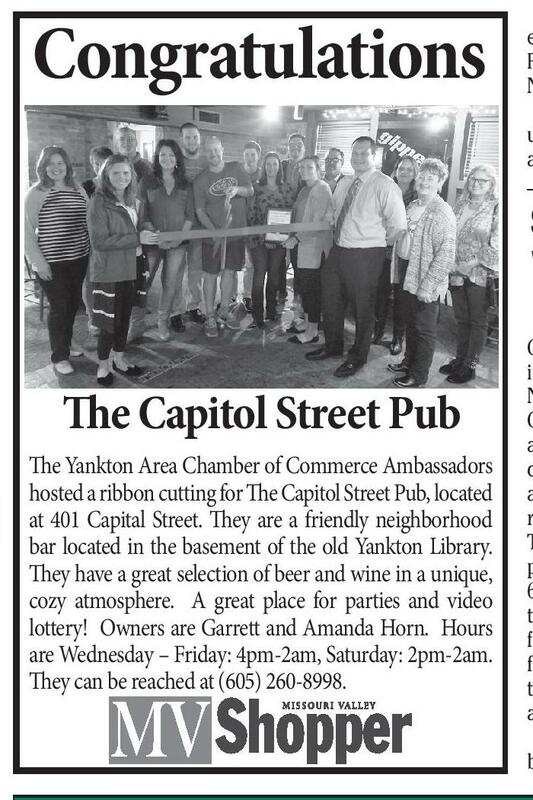 SDHCA Dakota MasterWorks Art Show Will Showcase Senior Creative Talents The Capitol Street Pub The Yankton Area Chamber of Commerce Ambassadors hosted a ribbon cutting for The Capitol Street Pub, located at 401 Capital Street. They are a friendly neighborhood bar located in the basement of the old Yankton Library. They have a great selection of beer and wine in a unique, cozy atmosphere. A great place for parties and video lottery! Owners are Garrett and Amanda Horn. Hours are Wednesday – Friday: 4pm-2am, Saturday: 2pm-2am. 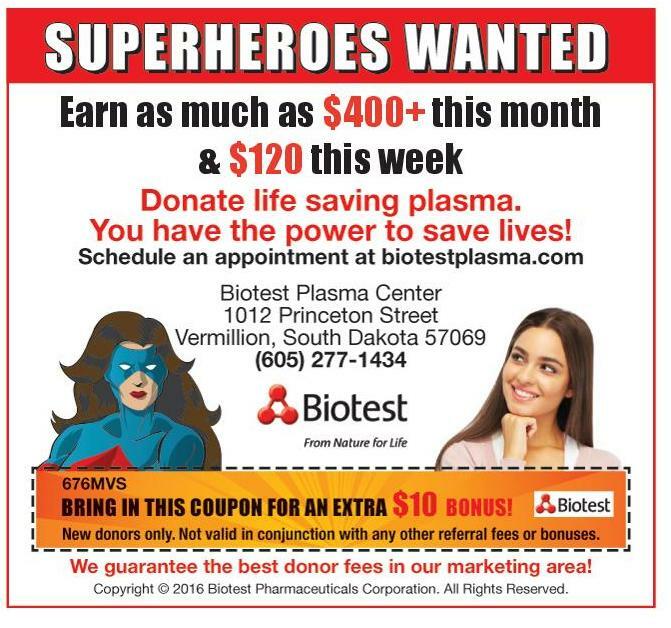 They can be reached at (605) 260-8998. The South Dakota Health Care Association (SDHCA), Great Western Bank, and KELO-LAND Television will hold its 22nd Annual SDHCA Dakota MasterWorksSM Art Show November 1st - 2nd, at the Jerstad Center on the National Good Samaritan Society Campus (Entrance K) located at 4800 W 57th Street in Sioux Falls. Art exhibits will be displayed Thursday, November 1st from 3 – 7 PM, with an Awards Reception beginning at 7 PM. The exhibit will reopen Friday, November 2nd from 10:30 AM – 12:30 PM. This event is free. We encourage the public to come experience the art talents of our South Dakota seniors age 60+. With a wide variety of entries, there will be something for everyone to enjoy. Whether it is a memory of a farm homestead, a family pet, the smell of a bouquet of flowers, or a scene from the old west, this exhibit is sure to take you back in time! Entrants this year range from ages 60 to 96. The SDHCA Dakota MasterWorksSM Art Show has been recognized with a National Mature Media Award Winner as a top community awareness project acknowledging that the second half of life can be full of creative growth and fulfillment. SDHCA Dakota MasterWorksSM was created to showcase the art talents and creativity of South Dakotans age 60 and older. Corporate sponsors include Welcov Healthcare, Tealwood Senior Living, Good Samaritan Society, Westhills Village, Clarkson Health Care, Dow Rummel Village, Tieszen Memorial Home, Jenkins Living Center, Bethany, Blackhills Healthcare, Sisson Printing, Fischer Rounds & Associates, and Imagery Photography. Contact: 605-3392071 with any questions regarding the exhibit.